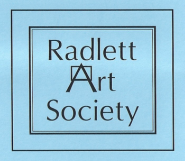 The annual Radlett Art Society membership subscription for 2019 is due on the 1st January. Cost of membership is £30 for an individual, (students £10) annually. Our preferred method of payment is by Bank Standing Order but you can also pay by cheque made payable to the Radlett Art Society. Please complete your details and the standing order mandate (where appropriate), also enclose a stamped addressed envelope to receive your membership card. Please send me/us membership cards for 2019.
and a stamped self addressed envelope for the return of my new membership card. In order to keep the cost of our subscriptions down we would prefer to send our newsletters by eMail rather than post. If you are currently getting them by post but are happy to get them this way please let us know. Obviously we are very happy to continue sending them by post to those people who do not use a computer. When members renew they should enclose an SAE to have their membership card sent in the post. If they choose not to do so – I email the card and keep the original to be collected from the lectures or the workshop. and thereafter annually on the same day until further notice in writing and debit my/our account accordingly.